Milk processing relies on thermal treatments warranting microbiologically safe products with extended shelf life. However, elevated temperatures favor also Maillard reactions yielding the structurally diverse advanced glycation end products (AGEs). AGEs may alter protein functions and immunogenicity and also decrease the nutritional value of milk products. Furthermore, dietary AGEs contribute to the circulating AGE pool with potentially harmful effects. Here, 14 types of protein-derived AGEs present in raw milk or produced during processing/storage of regular and lactose-free milk products were identified by nanoRP-UPLC-ESI–MS/MS. In total, 132 peptides (118 modification sites in 62 proteins) were modified by at least one studied AGE. Amide-AGEs were the most abundant group with formyllysine being the main type. 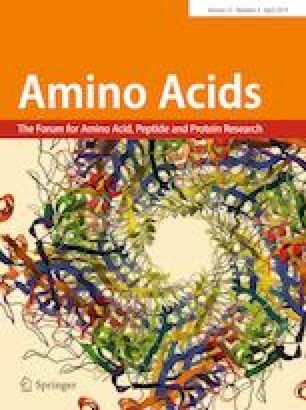 Most lysine- and arginine-derived AGEs and their modification sites have not been reported before. The number of AGE modification sites increased with the harsher processing conditions of regular milk, but remained stable during storage. This was further supported by quantitative data. The online version of this article ( https://doi.org/10.1007/s00726-019-02707-4) contains supplementary material, which is available to authorized users. We kindly thank Michele Wölk for performing an experiment to exclude formyllysine formation during the sample preparation procedure. Financial support from the Deutsche Forschungsgemeinschaft (HO2222/7-1, INST 268/289-1) and the European Fund for Regional Structure Development (EFRE, European Union and Free State Saxony; 100055720, 100092961 and 100146238) is gratefully acknowledged.